I’ve been running around the fields of Dorset in a slightly manic frenzy the last couple of weeks. 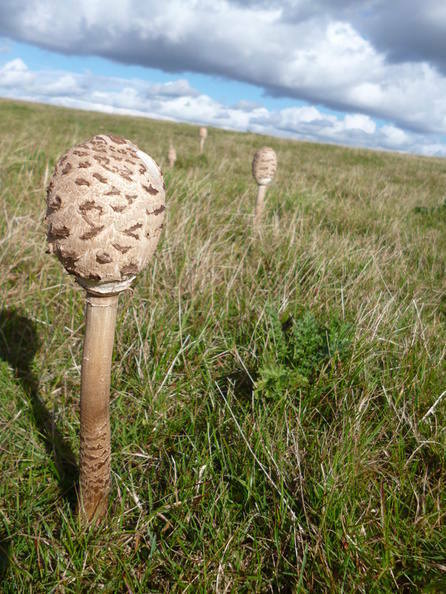 It's probably alarmed a few countryside users but to a sufferer of WFOD (wild food obsessive disorder) a field of parasol mushrooms (Macrolepiota procera) is an intoxicatingly exciting sight-and this year seems particularly good. Those of you who get my Facebook posts may have caught a recent short movie filmed near Corfe castle. I drove past a nearby field a few days later and found even more- 100 at a conservative guess although I was very good and left plenty to spread their spores. And yes, they make great eating- perhaps even approaching gourmet status, with a rich mushroomy taste and a succulent, slightly chewy texture even after cooking (mushroom expert John Wright of River cottage fame compares them to roasted chicken thigh). My favourite way of dealing with most wild mushrooms usually involves a frying pan and bit of butter and garlic. However, with such a glut, I have also been busy drying, freezing and of course giving away- I reckon it’s good to practice wild food karma- share the abundance and it always comes back one way or another. There’s a lot of fear around wild mushrooms in this country- yet go to the continent and they are a celebrated part of rural culture. There are some species that are tricky to identify. However there are also plenty that, with a bit of dedication, can be easily recognised- the parasol is one of those. 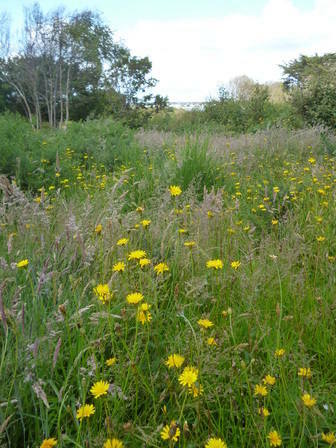 Habitat: open grassland and heath- it seems to prefer fairly acidic soils. early stages it is a drum stick shape (see pic to the right) this then opens up- like a parasol. It is edible at either stage although the flesh is most delicate when it’s young, it can also be stuffed and baked in the oven at this point. 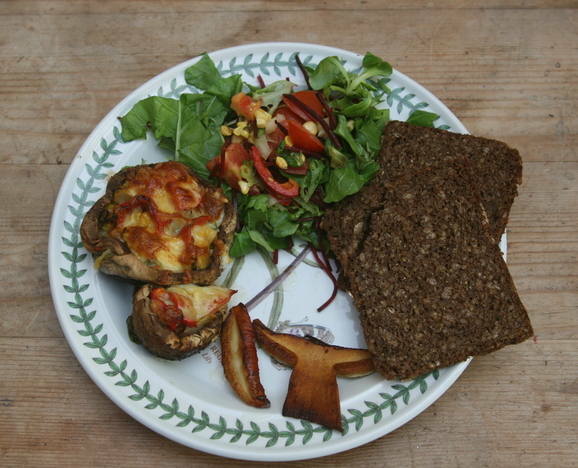 The photo bottom left shows some delicious stuffed young parasols using tomatoes, sweetcorn and herbs as a filling with some grated cheese on top (the other mushroom is a little bit of delicious cep/porcini but more about that another time). Stem: Long, up to 25cm by about 2 cm wide, with snake skin markings (this is quite tough and is usually discarded or added to a stock pot). Another good ID point is the 'cog' that slides up and down the stem (see pic above and left). 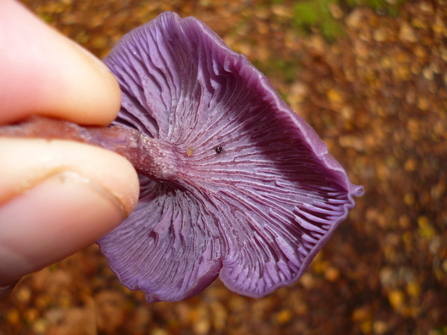 Gills: Creamy white, if they are turning a browny colour it means the mushroom is getting past it’s best. 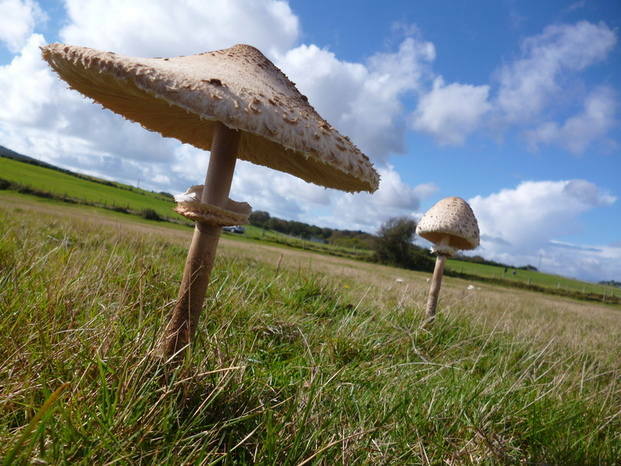 Smell: This is often useful when identifying mushrooms, in the case of the parasol it has a beautiful, warm, milk smell- particularly in the really fresh specimens. 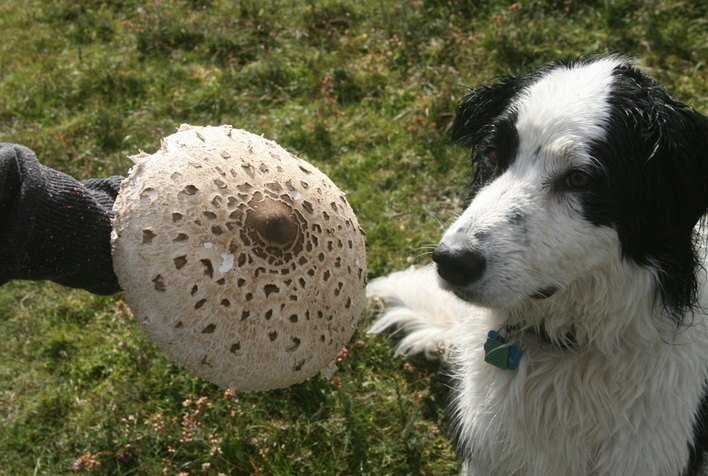 It should be noted there is also the shaggy parasol. As always, do more research but it differs in a few basic ways- the main one being it’s cream coloured stem without any snakeskin markings and it propensity for bruising orangey/red. 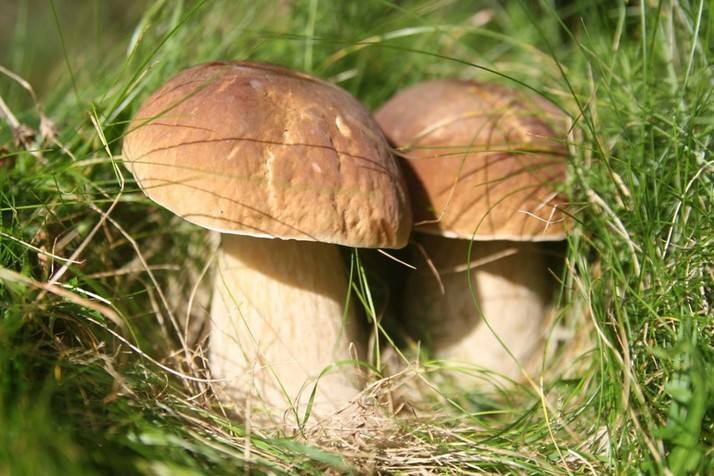 It is generally considered edible but has been known to cause dodgy tummies in a few people. 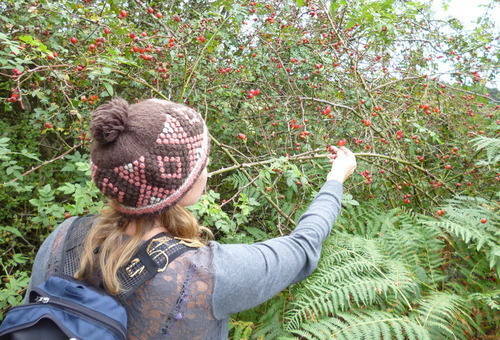 A recent foray in the New Forest yielded, amongst other things, a decent haul of beautiful red rose hips. 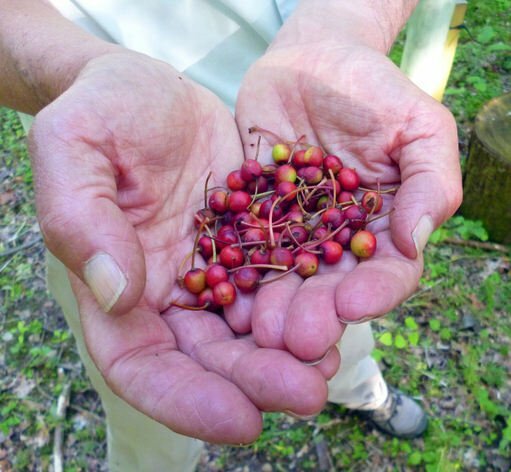 Our main focus was on the iconic rose hip syrup. This became famous in World war II when supplies of fruit and veg were low and the Institute for Food hatched a plan to harness the high vitamin C content of the rose hip and collect and process it on a grand scale (450 tons a year at its peak). The syrup was then distributed at a fixed ration price with priority given to young children. medicine for treating colds and flus. Firstly, their rich vitamin C content strengthens the immune system, secondly they have a cooling quality that brings down fevers and sooths inflammation and thirdly they are a mild but effective diuretic- assisting the body in the elimination of wastes through the urinary system. We gently heated the rose hips for about 20 minutes in a pan with a little water until they were soft and mushy. We then tried straining them through a jelly bag but did not get a lot of juice so we resorted to pushing them through a sieve exactly as I did with the hawthorn berry in the last post. It was then simply a case of melting in 50% brown sugar- it has to be high in order to help preserve the fruit and sealing into sterilised jars. It's delicious and I’ll be dipping into it over the next few months, drizzling some on my morning porridge on cold winter mornings or mixing a teaspoon full with some hot water for a soothing drink should any colds or flus start to rear their head. 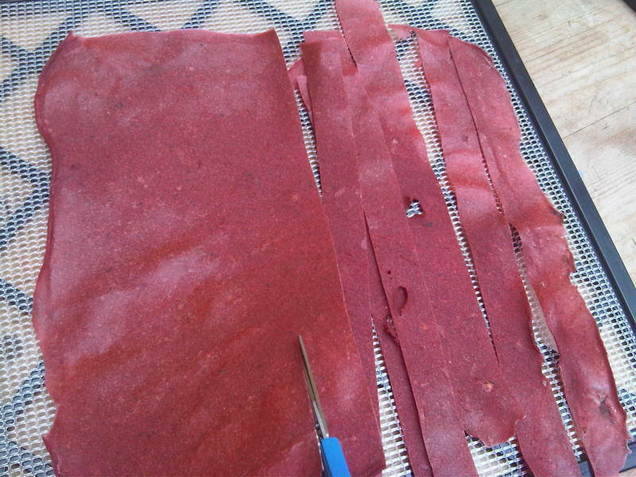 While we were at it, we also made some rose leather, taking some of the juice, melting about 20% sugar into it and then laying it out in the dehydrator. Unfortunately, my mobile dehydrator (the car) is no longer a reliable option now the days are getting shorter and cooler but an airing cupboard or oven on a very low heat will do the job almost as well. 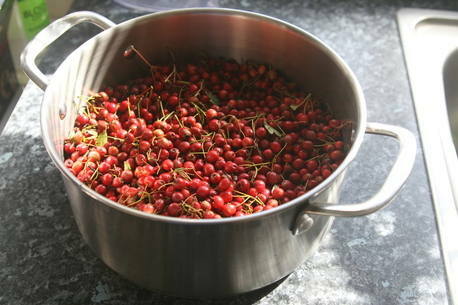 Finally, just a few days ago, I made some Rose hip vinegar with a fresh batch of hips gathered from a hedgerow near Arne. 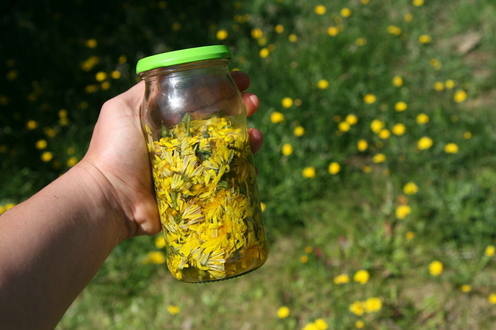 I delved into vinegar in the July dandelion post so will just remind you here that using a good quality vinegar is a super healthy and simple way to harness the nutrients from many wild plants. In a few months time the vinegar will be infused with the potent health giving properties of the rose hip and I’ll be adding it to all sorts of dishes to get an extra vitamin C kick. 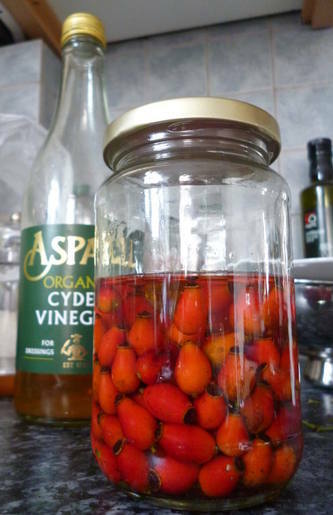 Assuming vinegar was reasonably easy to produce, I think this would have been a more practical and potent way of utilising rose hips during the war- no heat involved to damage the vitamin content. As mentioned in the previous post, there are certain red berries that are very poisonous so no complacent foraging please. The two most common native roses are the Field and Dog rose. There are another 12 native wild roses in the UK plus naturalised escapees and various hybridisations but for the wild foodie it is no great concern as they are all edible and have similar medicinal qualities. Two of the best ID points for all the wild roses, and the two things to be cautious of, are the hooked thorns which love to tear at skin and clothes and the mass of small hairy seeds inside the hip which would be extremely irritating to the digestive tract if eaten- this was the itching powder par excellence of childhood. 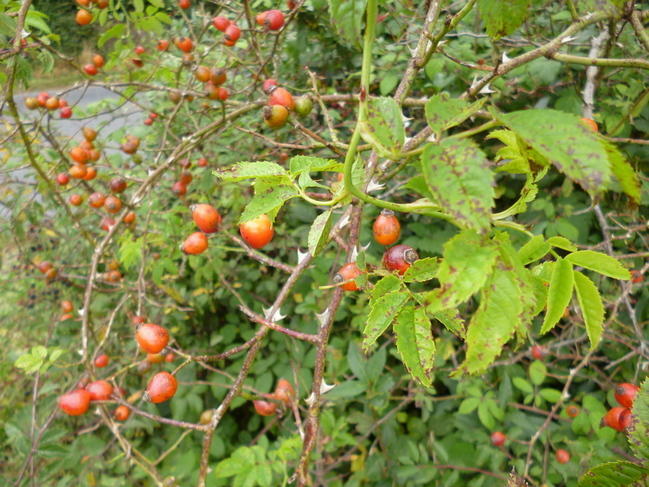 Rose hips will often hang on the hedgerow into early winter, giving a welcome splash of colour to a muted landscape. Once they have been bletted by the frost (softened and it seems sweetened) they can actually be eaten straight of the branch. Pinch between the fingers and, with a bit of practice, you can squeeze out some of the soft sweet flesh and leave the seeds where theyare. Hedgerow Hallelujah! 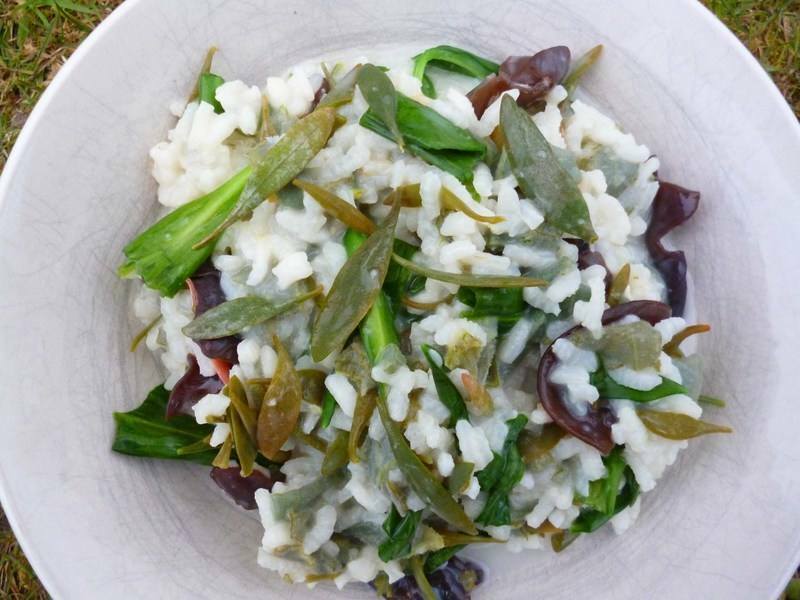 It’s early autumn and the land is bursting with wild food goodness! 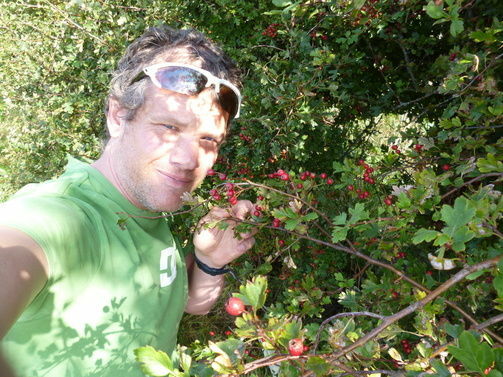 Last week, I was experimenting with the, often overlooked, hawthorn berry (Crataegus monogyna). Some of you may remember my post in late March regarding the rather tasty leaves and flower buds of the hawthorn tree. Well, a summer of growth later and now it’s the turn of the berries. Generally they are not considered a wild food treat due to the large stone and rather starchy flesh but this year I thought I would overcome that by making haw leather. And so last week I headed out to a favourite hawthorn patch near Wareham. I regularly ride past this hedgerow on my way to work and it feels like an old friend now. Its early spring blossom warms my heart and, as the months pass, I watch the hard green berries form and gradually ripen until, before I know it, they hang dark red and heavy in the early autumn air. There’s a great section in Ray Mear’s Wild Food Britain series where he and Gordon Hillman make the leather the true bushcrafty way (see link at the bottom of this post- it makes for fascinating viewing). I tried this approach last year and found it messy and hard work so this year I utilised a few modern luxuries and stewed it very gently for 20 minutes in a saucepan with a tiny bit of water before mashing and straining through a sieve. It was then simply a matter of spreading very thinly on trays and drying- I used a combo of a car, a shed and the oven on a very low heat. years. I don’t have a pic to hand but the one below is some hawthorn and crab apple (or possibly wilding apple) leather I subsequently made just a couple of days ago with Ruth and her posh dehydrator. From a medicinal point of view the hawthorn has many positive uses. Its main application is as a heart strengthener and balancer- making it a gentle tonic for both high and low blood pressure (it’s been highly endorsed for this purpose by Commission E- the branch of the German government that studies and approves herbal treatments). There is also evidence to suggest it is effective in breaking down calcium and cholesterol deposits in the arteries, making it helpful for arteriosclerosis (hardening of the arteries). Perhaps unsurprisingly, it is also rich in Vitamin C and anti-oxidants. 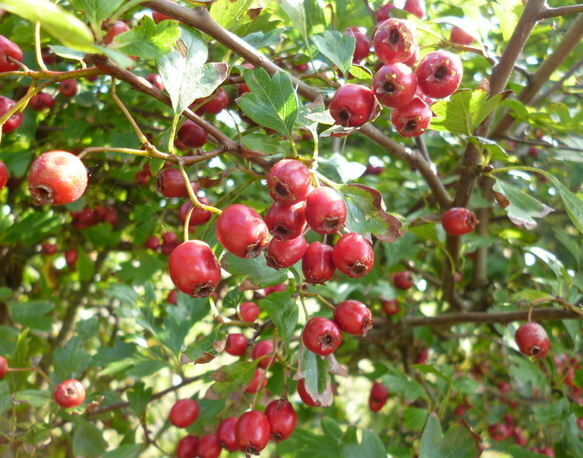 Foraging considerations: There are some seriously poisonous red berries out there so, as always, be sure you know what you are picking.The hawthorn is a sub-species of the apple tree (which in turn is part of the rose/ rosaceae genus). If you look closely at a berry you may notice it somewhat resembles a red apple in the texture and markings on the skin- the taste is also reminiscent of a starchy over-ripe apple. 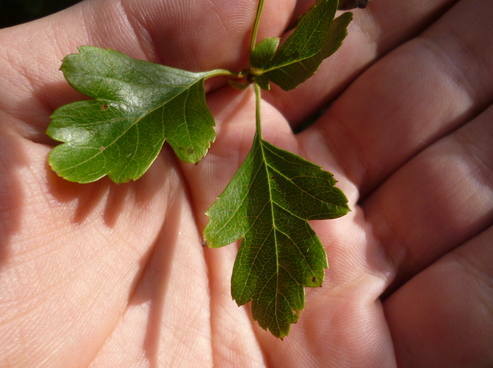 It is a very common tree of hedgerow and woodland, normally not growing more than 6 metres, with a small and simply lobed leaf - the hawthorn post from March has some more detail. At this time of year, there tend not to be as many thorns as earlier in the season and any still present grow at a 45 degree angle away from the trunk. 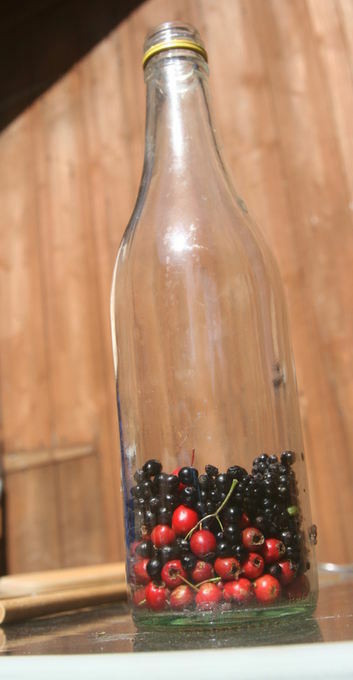 The advantage of this is that you can run your hand along a branch from base to tip and collect a good handful of berries with very few prickles- I picked around a kilo in twenty minutes and didn't worry about a few stalks and leaves ending up in the mix as they were strained out anyway. It's also worth being a bit fussy as the trees vary in the quality and amount of berries they produce. Finally, a fun thing I like to do at this time of year is to make an autumnal spirit to warm up the cold winter months. Last year I used brandy, this year I’m using whisky- mainly because the neighbours gave me a big bottle for looking after their cat! Here’s the start of it- hawberries and elderberries. I’ll add some blackberries, rose hips and sloes soon and then, come the depths of winter, test it out on some guinea p… er, friends. One of the things I love about Bushcraft is the glimpses it can offer of the ancient people who once roamed this land. I was vividly reminded of this on a recent visit to the British Museum. As I entered the long corridor of British prehistory, something caught my eye that made me stop dead in my tracks. Sitting nonchalantly alongside some early hand axes was a case full of broken and charred hazelnut shells- remnants of a meal eaten around 10 thousand years ago by some of the earliest people to return after the great ice receded and the forests reclaimed the land. I stood looking at that case of discarded shells for quite a while. And in those mesmerising minutes, as the modern city manically whirled around me, I felt a visceral connection to those ancient people. A realisation that in the moment when I reach out to a hazel tree (Corylus avellana), and pluck a nut from its branches, a little portal opens up between this world and a world long forgotten. For in that brief moment we share an experience that crosses the millenia and brings us together. And now, as another summer comes to completion, it's time again. It's always a gamble between waiting for the nut to fully ripen, and risking the squirrels taking them all, or picking them when they are still quite young. Sadly, I cannot emulate the foraging skills of a creature that lives full time in the woods, so I hedge my bets- picking them while they are fresh now but making a mental note to keep an eye open over the next couple of months for any trees overlooked by the squirrels. In their early stages, they lack the richness of the ripened versions but have an appeal of their own, offering a fresh fruity crunchiness .The first two pictures are from a tree nestled in an old hedgerow near Wimborne last week. Unfortunatly, they will not ripen after picking but this means I can justify eating them on the spot- at this time of year the shell is often soft enough to break in your hands. Otherwise, continuing the way of the ancients, a couple of rocks does the job. If I can find a few ripe ones, come late September or October, I’ll save them and roast them up on the embers of a winter fire- there are all sorts of recipes online but, as with a lot of wild food, I like to savour things as simply as possible. Foraging considerations: This is an easy one to identify, the hazel nuts resemble the shape of the shelled ones you would typically see in the shops- although usually a bit smaller (most of the commercially sold ones are from cultivated varieties). At the moment they are a pale green colour but they will get browner as the season progresses. 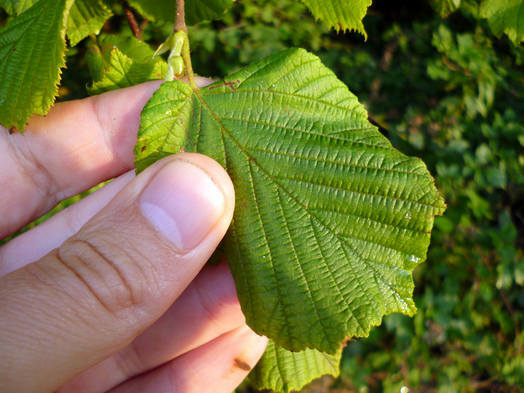 The hazel tree is one of our most common trees. 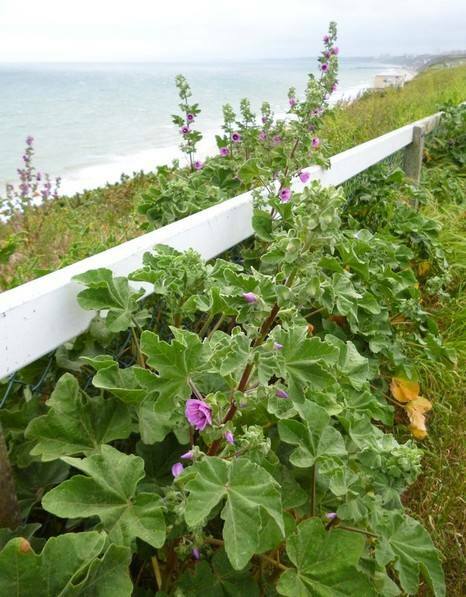 It grows to 5 or 6 metres tall with a smoothish grey brown bark and a rounded leaf with pointed tip. 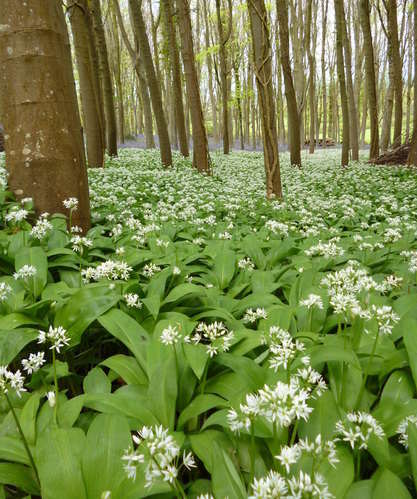 It grows in old hedgerows and often as a neglected coppiced understorey in the woods. In this habitat it can appear more like a shrub than what most people consider to be a tree. Those deep in the woods are unlikely to produce nuts though and, even in a tree that is producing a good harvest, it’s common to get a few blanks where the shell is hollow- Mother Natures way of preventing complacency perhaps. Incidentally, in Celtic mythology there is much legend behind the Hazel. 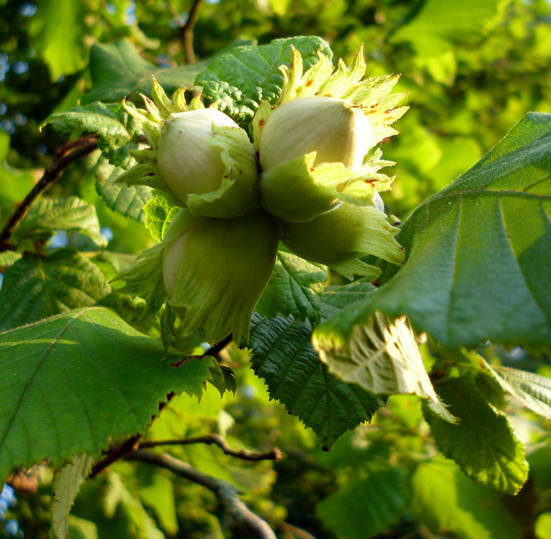 The nut was esteemed by the druids as it was considered to bestow great powers of wisdom. The old saying ‘in a nutshell,’ meaning to condense some important information into its essence is thought to stem from this. it’s tasty, can be used in a diverse range of dishes and is a remarkably rich source of essential minerals, vitamins and protein. With the recent sunny weather, I’ve had great fun stocking up on some of Dorset’s finest seaweeds to keep me going through the winter-that's me on the right heading off for an early morning forage at Dancing ledge on the Purbeck coast last week. Normally I’ll start foraging in the spring, as this is when they start to put on their vibrant new growth, but with all the stormy weather, the sea has been a bit too murky until now. There is not space to go into all the edible varieties here so I’ll touch on the three main ones on my recent ‘shopping’ list- all of which are very common and easy to recognise. Olivey brown fronds - see photo on left- with lots of air bladders that allows them to float in the current- it’s the same seaweed that pops when you squeeze it. 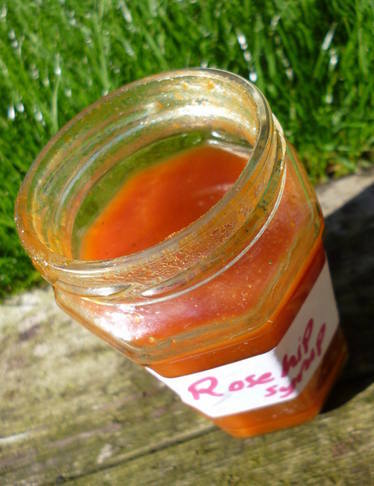 It has a fairly strong flavour but dries very well and can then be broken up and added to soups and stews over the winter. 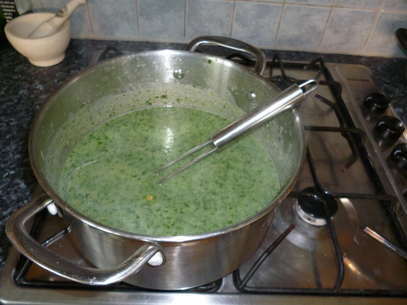 It also works well as a simple steamed vegetable (the air sacks give it a really succulent texture) or just add a potato or two and liquidise for a serious seaweed soup. I have seen 150g bags of this (the equivalent of a few handfulls) on sale in a health food shop for nearly £3. 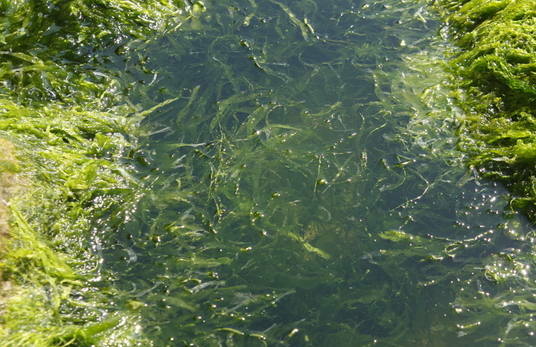 Sea lettuce (Ulva lactuca) and Gutweed (Enteromorpha agg). Sea lettuce, as its name suggests, looks rather like a lettuce leaf, all be it a soggy slightly glowing one- see photo below. I have a favourite spot off Mudeford spit where big underwater fields of it billow gloriously in the current. 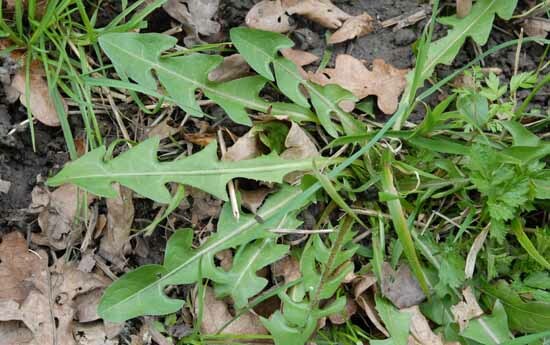 Gutweed- below and to the left- has a similar taste. Unfortunately, its name does nothing to advance the wild food cause. However, it simply refers to the hollow tubular nature of the fronds which, as the plant photosynthesises in the sunlight, produce oxygen and float upright in the water. Both these seaweeds are much loved in Japan, where they also grow, and are nutritional super foods-containing amongst other things, massive amounts of Vitamins B1 and C and over 20 % by dried weight in protein. They can be eaten fresh but I prefer to dry and then either eat them raw by crumbling them into other dishes or stir frying and adding a dash of soya sauce. 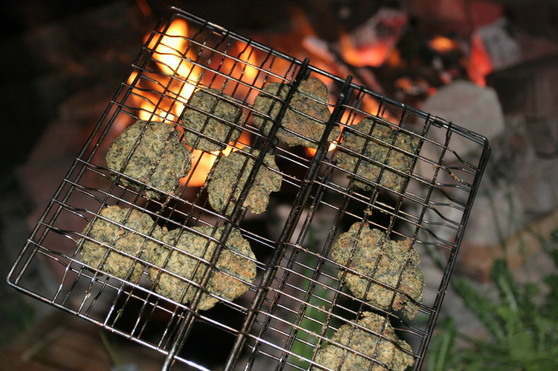 I made some wonderful savoury biscuits, while sitting around the fire last year, they involved crumbled sea lettuce, rice flour (any flour would work), soya sauce and water and were pretty tasty. 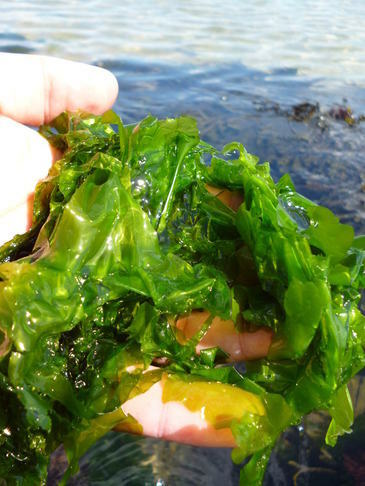 Foraging considerations: There are no poisonous seaweeds in this country (apart from the Desmearestia species which only grow in deep water, far from the shore). That said, some are certainly tastier than others. In my experience, it seems the general rule is- the darker the seaweed, the stronger the taste. 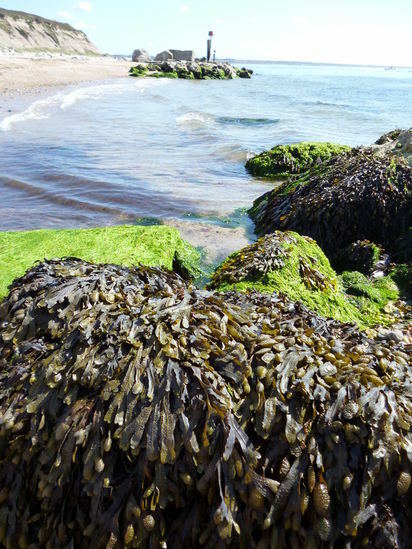 The green seaweeds such as Sea lettuce and Gutweed tend to be milder and perhaps more suitable as a beginners’ choice with the Bladder wrack perhaps being an intermediate one. Always rinse a few times to get rid of any sand or debris. Ideally I like to get in the water and pick the seaweed as it floats in the current. That way it is far less likely to contain debris plus it also feels more exciting diving down amongst the rocks to forage- a total wild food immersion one might say. Obviously make sure you are a confident swimmer for this and know local currents and tides. Alternatively, look for decent sized rock pools at low water. Always make sure that you leave at least 10 cm or so above the hold-fast on the rock (a bit like a plant's root) by breaking or ideally cutting the seaweed above it. That way it will continue to grow and your impact is minimal. I always assess water quality before collecting any seaweed but around the South West I generally pick with confidence. That said, I always wait for decent periods of dry weather when there is not going to be any run off from the land and would stay clear of industrial areas or old mines such as the coastal tin mines in some parts of Cornwall. If collecting near a harbour mouth, it's also sensible to wait for an incoming tide- in order to minimise any polution that may be coming down the river (of course, if you believe pollution to be a significant issue then better to stay away from that area altogether). 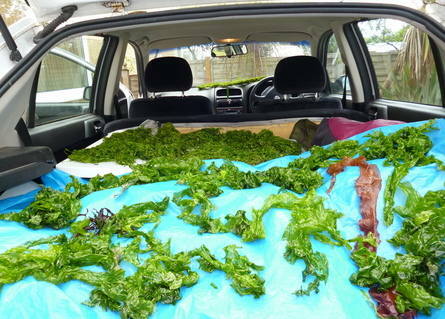 Finally, I have found one of the most efficient ways of drying all sorts of wild food is a car- with a window slightly open to prevent moisture building up. With seaweed. it bestows an interesting ‘seasidey’ scent which you won’t get from your average Halfords' air freshener but, on the plus side, it dissipates after a couple of months and makes an excellent burglar deterrent in the meantime. eat fresh, nutrient rich food that nourishes the body and mind- and what better plant to kick that off than the vibrant yellow dandelion? Perhaps its most well known use is as a mild diuretic. This word can have negative connotations but a natural diuretic in moderation is very helpful for eliminating toxins through the kidneys, thereby benefiting over all body function. It can also be beneficial for high blood pressure, bloating and fluid retention. Furthermore, while pharmaceutical equivalents or caffeine products deplete the body of potassium, dandelion is rich in the stuff. The whole plant is edible. The flowers are best picked when the sun is shining as they close up in low light and lose their sweetness. Last year I picked a jar full on the summer solstice and gave it the vinegar treatment. I’ve touched on this method before but I'll go into more detail now- a good quality vinegar is very effective at leaching out the nutrients from whatever plant is placed in it (I like organic apple cider vinegar as it has a slightly fruity tone and many health benefits). After a month or so of soaking it can then be strained and used sparingly over salads, pastas, soups or whatever takes your fancy. As well as containing the essential goodness of the plant, the vinegar has a positive alkalising effect on the digestive system. 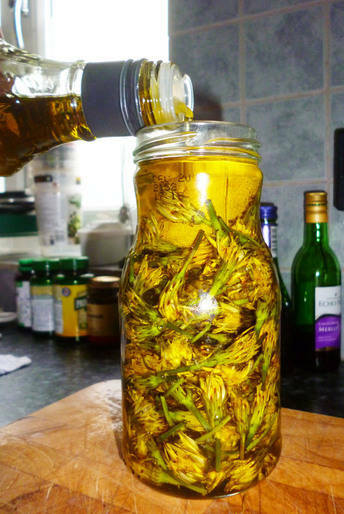 This year, I’ve also been experimenting with some dandelion olive oil, an almost identical process to the vinegar but using olive oil- I put a small pebble from the beach into the top of the jar to weigh it all down and prevent any flowers from being exposed to the air and becoming mouldy. I reckon this will be delicious after a few months of infusion. The leaves are great mixed in with a green salad. To the modern palette they can seem somewhat bitter but this is a taste our hunter gatherer ancestors would have taken for granted as quite a few wild plants have this characteristic. While you may not want to munch down on a whole bowl of the stuff, it is really good to include some bitterness in the diet as it encourages the production of acids in the stomach which aids digestion and also stimulates bile in the liver which helps to break down fats in the body. 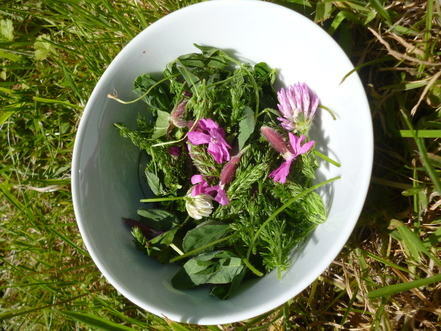 combination of dandelion leaf, yarrow, clover, pink campion and common sorrel. It’s best to cut out the central vein of the leaf as this contains a latex like substance that is particularly bitter. This is a great green to know as, even in winter, there are nearly always a few leaves around. Finally, of course, we have the roots. Dandelion coffee is one of those mythical wild food concoctions which mainly gained popularity in the Second World War when supplies of real coffee were low. It's even available commercially online and at specalised food stores so there must be something to it, but it doesn't do much for me (give me acorn coffee anyday). Personally, I regard the root as more of a survival food due to the fairly tedious process of collection- if you rush the extraction it usually ends up snapping in the soil. That said, it's quite tasty as a roasted vegetable and a fun thing to try. Autumn is the best time to have a go as the roots are at their fattest. 'agg' or 'aggregate', a kind of botanical shorthand for 'lots of types that look very similar and are too complicated to list.' They can grow up to about a foot off the ground but consistent features include a hollow stem that exudes a white fluid when cut and shiny and hairless, serrated leaves growing in a rosette on the ground. Incidentally, the word dandelion is thought to come from the French ‘dente de lion’- teeth of the lion referring to the jagged nature of the leaf. 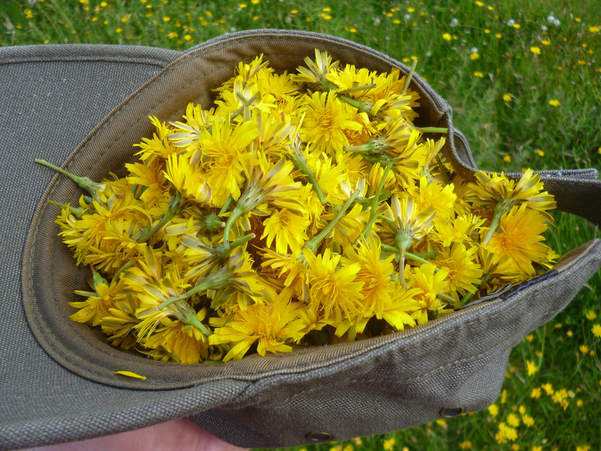 Sometimes the dandelion is mistaken for it's relative the cats ear but these are also edible with similar health properties so no need to worry.